At a recent Nassau Suffolk Water Commissioners’ Association (NSWCA) meeting sponsored by the Massapequa Water District, the Association elected a new Board for the 2019 term, which runs through December 31, 2019. Massapequa Commissioner and former NSWCA President Raymond J. Averna, Commissioner Thomas P. McCarthy and Commissioner Francis J. Flood hosted the meeting. 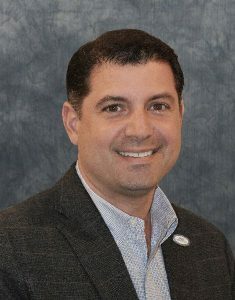 The newly elected NSWCA 2019 Board includes incoming President Michael F. Rich III of the Oyster Bay Water District who succeeds outgoing NSWCA President Vincent Abbatiello; 1st Vice President William Schuckmann of the Hicksville Water District; 2ndVice President Kenneth P. Wenthen Jr. of the West Hempstead Water District; Secretary Amanda Field of the Plainview Water District; and Treasurer Lawrence F. Zaino Jr. of the Carle Place Water District. 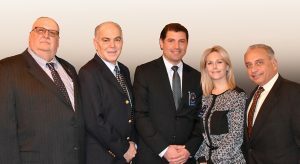 Left to right: William Schuckmann, Kenneth P. Wenthen Jr., Michael F. Rich III, Amanda Field, Lawrence F. Zaino Jr.